This is a Genuine DOCKMV Klick Fast MOLLE (Modular Lightweight Load-carrying Equipment) dock. It provides a secure mounting point for your Airwave / torch Etc that has a KlickFast stud. Two webbing straps on the back of the dock, one vertical and one horizontal. 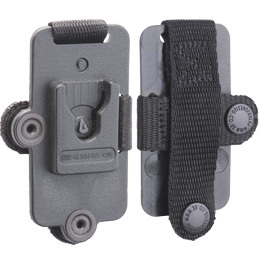 Vertical strap provides 3" (75mm) and horizontal strap provides 1 1/4" mounting areas.